We spent a day exploring the Spanish River near Massey, Ontario in preparation for the Sagomok Fall Walleye Classic Tournament happening in late September. Although early July conditions are unlikely to be similar to late September, a day familiarizing ourselves with the general river makeup was certainly helpful. It is quite a large section of river that is available for the tournament, ~30 miles from the dam at Espanol to the transition to the North Channel of Lake Huron. This day focused on a 8-10 mile stretch of river below the boat launch in Massey, the tournament starting point. There will be a pre-fish day before the tournament that we’ll likely use to explore the areas closer to Lake Huron. There are large stretches of the river that are relatively flat and featureless with only shoreline structure present. Depths range from 4 to 11 feet, increasing in depth as one heads downriver. 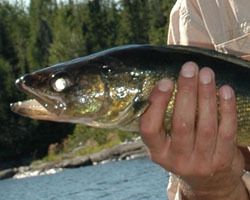 A few deeper holes are present that might hold a few fall migrating walleye are present. These may be good especially where the deep areas match up with a bit of increased current. One set of rapids in conjunction with a large deeper hole produced our only two walleye for the day using live bait. While we weren’t too successful this preliminary information should help come tournament time, it is at least better than going in blind.